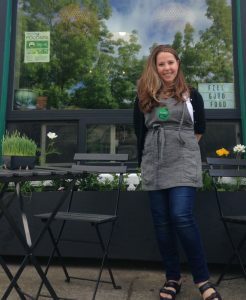 ABOUT PURE: Situated in a tiny storefront on Bank Road Pure Café has become a staple for delicious, healthy food on Vashon. Since opening time have improved their storefront, fine-tuned their menu, embraced technology and are working on bottling their very popular Organic Tahini Dressings for wholesale. Currently you can find their dressings at Vashon Island Thriftway! Stephanie Morris and her husband, Chef Steve Knoder are a dynamic duo and they are supported by a staff of 4 part-time employees. Pure offers Vegan and Gluten free menu options. It is not just a summer business, in the cold months they offer hot soup, curries and of course Buddha bowls. They are famous for their juices, smoothies, and their Plant Based Raw Vegan Pizza! Which sells out every weekend. They are working on bottling their yummy salad dressings for people to take home. Pure was the first businesses on the island to offer a mobile app enabling customers to have their orders ready when they walked in. They were also the first to install self-ordering kiosks. Which allowed employees to be more efficient and get to know our customers, instead of asking them " do you want rice or quinoa?" we get to ask them" how life? what’s happening?" Stephanie’s Story: My family *moved to Vashon in 1992. While I was living here I noticed there were no health food focused restaurants on the island. In 2009 kale, quinoa and avocados were not so trendy and the words Vegan & Gluten Free were not on menus and especially not in the same sentence. I have always been always passionate about healthy food, vegan & vegetarian food, organic juices and wanted to bring something like that to the island. I was waiting tables at the Quartermaster Inn, where I met my future husband, who was the executive chef and trained in The Seattle Art Institute Culinary Progaram . One day he asked for some input on some foods could he prepare for an anti-inflammatory menu he was working on. I sent him an email with a video of a raw food chef massaging kale , soaking seeds, pressing juices, talking about the benefits of quinoa ... he was intrigued, he applied his skills and mad knife skills ! and the rest is history. Why did you join the Vashon Chamber of Commerce? I joined the Chamber because I wanted to be part of the business community. The Chamber seemed like a good place to start. And I was so glad I did! From the get-go, I knew that they cared about our business and as Pure grew, whenever we had a question or needed help, they listened and helped us find solutions. How have you benefited from Chamber Membership? The Chamber introduced us to other members, which provided us with opportunities to network with other business owners, who have since then become colleagues and friends. The Chamber has continued to work with us to find creative ways to promote our small business and others like us. We’ve advertised in the Heart of the Sound Map, participated in the Shop Vashon Passport, and provided refreshments for the Vashon Health and Wellness Fair. We are very glad to be a part of the business community on Vashon. We all know what it is like to run a small business and having a community to relate to and work with has kept us going.